The ‘Namajapa Yatra’ started from west nada of Ernakulam Siva temple and ended at the east nada after encircling the city for three hours. 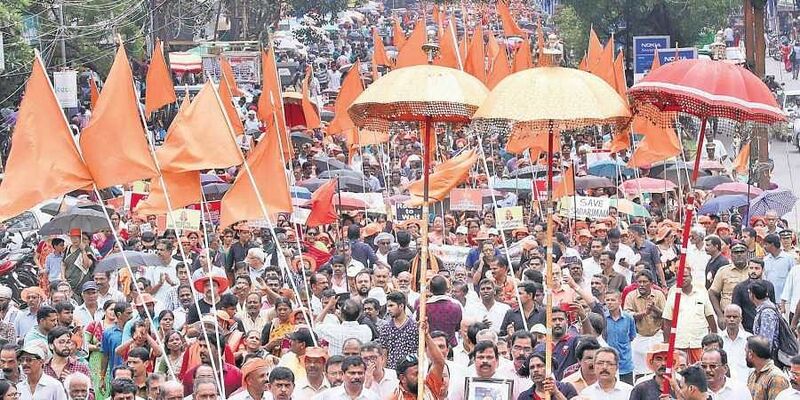 KOCHI: The orchestrated sequence of the drums and the chanting of Ayyappa mantra rent an air of devotion in Kochi as tens of thousands joined the ‘Namajapa Yatra’ organised to protest against the SC verdict allowing women of all ages to enter Sabarimala. The march was organised by Ernakulam Karayogam, Ernakulam Kshetrasamithi and 27 other Hindu organisations. The ‘Namajapa Yatra’ started from west nada of Ernakulam Siva temple and ended at the east nada after encircling the city for three hours. Leaders from the Congress and the BJP also participated in the yatra. The yatra began with the lighting of the lamp by Guruvayur Thantri Chennas Dinesan Namboothiripad. He said that the thantri has the hereditary right to conduct all religious rites at the temple. Traditionally, the thantri, or priest, is the ultimate authority on matters relating to ritualistic practices, he added. Protesting against the Supreme Court verdict, Alangad Sangham conducted a ‘Petta Thullal’. Thousands of female devotees marched through the arterial roads of the city chanting Ayyappa Mantra.